CLAY COUNTY, Ind. 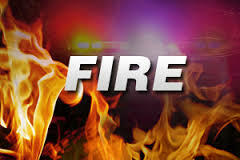 – Fire crews were called out around 6:00 p.m. Wednesday evening to a fire at a home on County Road 400 North just east of Brazil. Witnesses say that the father told his son to burn a mattress in the back yard. That is what he did, and the wind blew the mattress into the house.